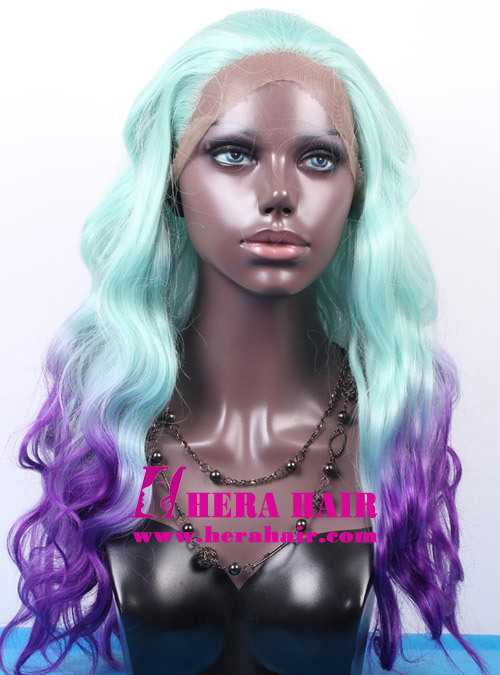 This synthetic lace front wigs is Hera 18 inches wavy ombre color light blue and purple synthetic lace front wigs, which Hera is the leading company dye synthetic fibre in China. The main different of synthetic lace front wigs with human hair lace front wigs is the hair materials, which synthetic lace front wigs mainly use heat-resistent fine Chinese fibre, Korean fibre and Japanese Kanekalon fibre but human hair lace front wigs use 100% human hair. The most feature of synthetic lace front wigs than human hair lace front wigs is cheaper price but also have very good look same as human hair lace front wigs because the new fibre is more near human hair. But the real is real, so we have to accept that synthetic lace front wigs can't get the same feeling and look as human hair lace front wigs. But synthetic fibre have more color choice, especial for more light color choice. 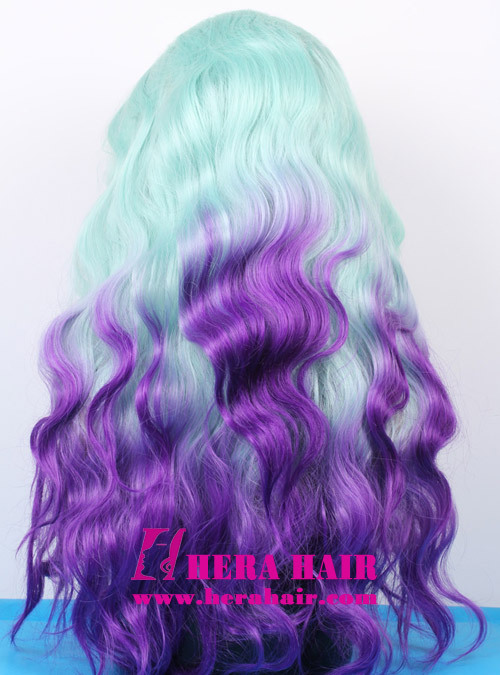 Hera could dye the synthetic fibre to any color what you like, which is very advanced technology in hair industry, such as these pictured ombre blue and purple color. Synthetic lace front wigs another feature is synthetic fibre could do any permanent texture but human hair can't do permanent texture. So if you like fancy color and texture lace wigs, you could choose synthetic lace front wigs. And synthetic lace front wigs is a good choice for perform. 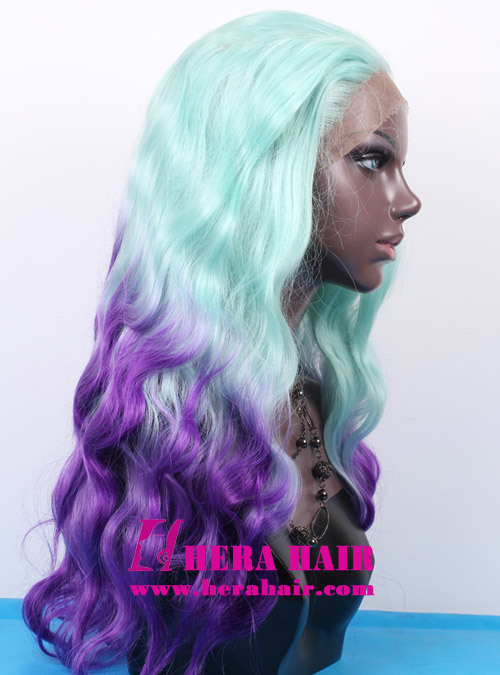 Hera synthetic lace front wigs wholesale MOQ is only 10pcs and you can mix the hair length, hair texture and hair color. We also can do any hair density and structure cap synthetic lace front wigs. If you have big quantity order, you also can get better discount. We welcome any body, hair stylist, hair salon, Cosplay association, Opera House etc to wholesale synthetic lace front wigs from Hera.